The Edison Firm Full Firm Pocketed Coil Mattress by Sleep Designs at Moore's Home Furnishings in the Kerrville, Fredericksburg, Boerne, and San Antonio, Texas area. Product availability may vary. Contact us for the most current availability on this product. The Edison Firm Mattress is a great value with many quality features that are usually found in more expensive mattresses. With over 800 Pocketed Coils supporting every inch of your body, foam encased for a firmer edge and layers of firm foams including Gel Infused Foam for a cooler nights rest, you'll find this mattress firm and supportive. 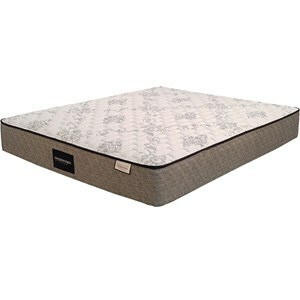 A very nice mattress for a stomach or a back sleeper who prefers a firmer feel. The Edison Firm collection is a great option if you are looking for Mattresses in the Kerrville, Fredericksburg, Boerne, and San Antonio, Texas area. Browse other items in the Edison Firm collection from Moore's Home Furnishings in the Kerrville, Fredericksburg, Boerne, and San Antonio, Texas area.